Please arrive at least 40 mins before your match time. Timings are subject to change so please come down and watch as you might be able to get on earlier! The winners of the matches are required to mark so no long showers ! 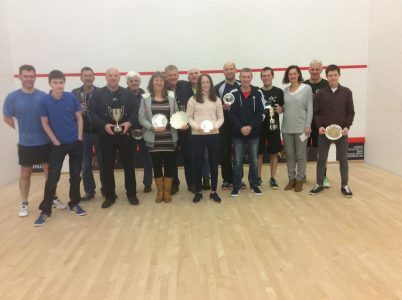 Senior Closed Squash Championships – to be held on 19 / 20 / 21 January 2018 at Duffield. CLOSING DATE 5 JANUARY ……….. The boiler at Duffield broke down today Friday – there are court heaters but there may be limited hot water for showering – so please come prepared ! The clubhouse may be cold. Proposed date : Wednesday 19 June - venue to be confirmed. Please contact County Secretary to add any items for agenda and discussion.